Cruising to the Bahamas with family and friends for Bahamas weddings beach celebration at Nassau’s Blue Sail Restaurant and Beach Bar is great fun. Kristina and Matthew chose this intimate and sweet way to tie the knot in the Bahamas. Arriving in Nassau early morning and in the port of Nassau for one day, the bride and groom had the best of both worlds as they experienced sea and land activities. The couple, family and friends arrived aboard the Carnival Fantasy at Festival Place then travelled to the lovely Sandyport Beach at Blue Sail for their special celebration. 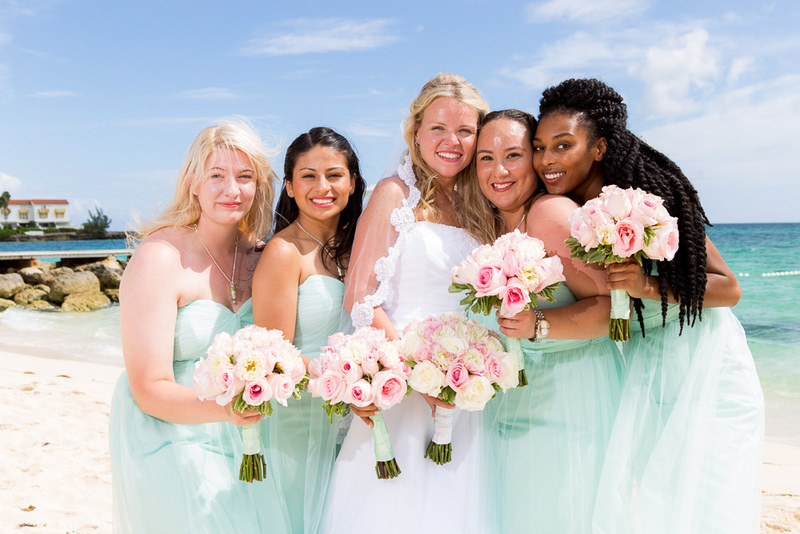 Kristina’s mint and blush color palette blended perfectly against the aquamarine blue ocean backdrop. Following a beach ceremony performed by Rev. Dr. Reginald Eldon, guests enjoyed cocktails and passed hors d’oeuvres of Gourmet Sausage Rolls, Breaded Chicken Tenders, Tartlet of Goat Cheese, Smoked Salmon and Creamed cheese on a bagel and Avocado Guacamole with Grilled Prawn in Shot Glass. The group moved to Blue Sail’s Dining Room for lunch. The menu featured Lobster Bisque, Chicken Breast with Red Wine Sauce and Mushrooms, Grouper with Tropical Rice and Tenderloin of Beef with Green Peppercorn Sauce and wedding cake dessert. Thank you, Kristina. We were delighted to host you and your guests for your magical day in the Bahamas! We wish you much joy and happiness! Photos courtesy of Cay Focus Photography.